Duncan Pflaster’s A Touch of Cinema is part of Spotlight On: Rise of the Phoenix at The Wild Project. Aliza Shane directs this story of resistance, set in a land far away but only too close. At first, it looks like actress Dina Kummerspeck (Diánna Martin) and her painter husband Tomas (Lars Engstrom) are preparing for just another charming dinner party for their in-group of movie stars. However, when Dina retorts that it’s not just a party, we should believe her. Dina’s arriving friends lament that it’s been too long, and note her electronic ankle shackle. Dina is under house arrest; after being persecuted over her perceived seditious film “Canine Teeth”, she has undergone “re-education” and is prevented from appearing in public. 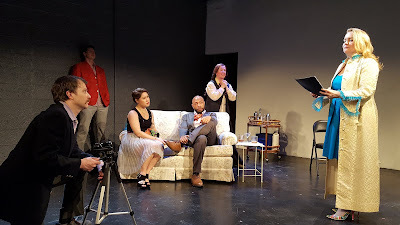 Regina Fontaine (Kristin Vaughan) is many shades of elegant, with the kind of class that has been phased out by the hated new regime of President [unmentionable]. Martin Dure (Russell Jordan) has a flamboyant way of suggesting that they liven up Dina’s shackle with some rhinestones. Graeme Tupper (Michael Andrew Daly), their co-star, sympathizes with Tomas over the loss of his famous mural, which is about to be painted over by a state-sanctioned artist. Tomas, who had not been told of this, is also sad to hear that Martin has been blacklisted. Mind you, even in a room full of thespians, Graeme’s pal Sally Haze (Lucy Spain) stands out. The young ingénue always seems to be trying very hard to please. The current regime is very hostile to the arts. We hear the story of the career that was ruined when the censors asserted that a cello sonata was too similar to the national anthem of another, non-fascist country. So, even though Dina is banned from performing, she respectfully asks her assembled colleagues and friends for an impromptu read-through of the new screenplay she has written. Someone in the room immediately urges the group not to do anything that would be misconstrued as treason. Others are too intrigued not to read it, while the rest need to be reminded of ground-breaking films of the resistance, such as Chaplin’s “The Great Dictator” and the French actress Arletty’s risk-taking performance in “Les Enfants du Paradis” during the Nazi occupation. Martin has a way of flirting with the affable Graeme—who appreciates Martin’s “masculine vulnerability”—and the two finally share a stage kiss. In the end, Dina has in fact made another movie. The reading has been filmed and will be taken out of the country by several people in that very room who will be starting a new life as refugees in a land that supposedly welcomes them: the United States of America. Who is afraid of starting over? Who among them is a collaborator? Who has yet to come out to their mother…at that age? A Touch of Cinema is a stirring reminder of the power of the arts during repressive regimes. Where the story takes place is anyone’s guess, but it doesn’t matter. Since World War II, many countries have forgotten the lessons of history. The characters in this play say that America is/will be the place that, just like in the movies, fights evil and offers freedom to all. Duncan Pflaster gives his characters many witty finishing touches, from the classy (lipstick color “cherries in snow”) to the campy (“Trying to be unobtrusive? With those shoulders”). If you like “Casablanca” and the other fascist-busting films of the 40s, you will find this play moving. If you are not familiar with the 20th Century, work like this and the others referenced herein will give you strength. Aliza Shane stylishly directs the talented cast through many moments that will be familiar to actors and those who fraternize with them. I could become accustomed to Tricia Bastian’s flashy costumes.